The first to practice in a regular way in LeMars was Dr. Earl, who was not a regular graduate, but seemed fairly successful for the time he remained in LeMars. The town was very small, the county thinly settled and not much was required except the administering of simple remedies, such as that class of doctors were conversant with. Dr. W.H. Ensminger located at LeMars in February, 1877. He came from Ottawa , Ill. , where he had practiced for several years. Prior to that he had practiced in Putnam county, Ill. He is a graduate of Jefferson College , Philadelphia , and is now the oldest practitioner in LeMars, having been here thirteen years, during which time the profession has undergone many changes. Dr. W. B. Porter, a graduate of Rush Medical College , Chicago , came in about this time. He was associated for a time with Dr. Lindley. Porter got into personal difficulty here, was shot in the neck by one of the citizens, and was finally convicted of a dastardly crime and served several years in state prison. He subsequently removed to Sioux City , where he died some years ago. Dr. C.J. Hackett came here from Sioux City in 1878. He is a “regular” and graduated from the Medical College of Virginia in 1860, and from the University of the City of New York in 1861. He is one of the present successful physicians and surgeons of LeMars, and one who stands high in his chosen profession and is a constant student in all that pertains to medicine. Through his influence and rapidly growing practice, Dr. J. W. Hines, a graduate of 1861 from the University of Virginia (regular), came to LeMars and became his partner – the same relation still existing. He had practiced in Virginia and West Virginia until he came here about 1860. He, too, is a credit and honor to his fraternity, being a thoroughly posted physician and surgeon. The next to open an office and offer his services to the people in this section of the county, was Dr. Paul Brick, a graduate from the College of Physicians and Surgeons of Chicago. He had practiced here some time prior to obtaining his diploma in 1890. Next was Dr. A. W. LaRue, a graduate of Starling College , Ohio . He is now deceased. Dr. Lee was the next physician to locate at LeMars. 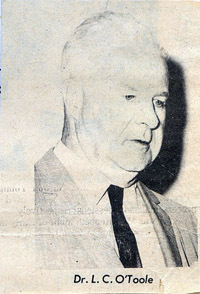 Dr. W. O. Prosser, a graduate of McGill University , Canada , and one of the successful practitioners of today at LeMars, was the next to enter the field. He is from a thorough college, which has fitted many hundred of able physicians and surgeons, not a few of whom are now practicing in Iowa . Dr. Bennett and wife, both of the homoeopathic school, practiced in LeMars about two years. Another physician, who remained only a short time, was an old gentleman named Warren . He was a “regular” and had practiced for a time at Sheldon , Iowa . Dr. Richey was next to locate here. He is a graduate of two most excellent medical colleges in Kentucky . He is still in practice at LeMars, where he gets a good patronage, and is successful in the same. A homoeopathic physician, named Dr. H.P. Bowman, came in next, and is one of the honored members of the Plymouth county medical fraternity. Following him came Dr. Garisch, who was county physician several years. He was from an eastern college of the regular school. Dr. Clark, of Rush Medical College , Chicago , came in next. He afterward removed to Colorado . Dr. Peter Schwind, of the State University at Iowa City , was next to locate here: he is still practicing in LeMars. Dr. J.O. McMahan, a graduate of St. Paul Medical College , of the class of 1885, first practiced in Michigan , where he made rapid progress and was eminently successful for a young practitioner. He came to LeMars and located in the spring of 1887, and is now numbered among the good physicians and surgeons of his town and county. He is at present county coroner, and county and city physician. His is a genial, whole-souled nature, and his manner, as well as his knowledge of medicine, is always certain to achieve for him success in any community. Dr. C.M. Hillebrand, a native of Germany , came to American when a mere lad, in 1855, and grew to manhood in Freeport , Ill. , where he received a good education. He then went to Prussia and studied medicine, finally graduating from the University of Berlin in 1868. He then entered the practice of his profession at Freeport , Ill. , where he was very successful for many years. He was injured in a railway wreck near that city, and was obliged to give up his practice for several years, but finally regained his health sufficiently to commence again. He removed to LeMars in January, 1890, having been impressed with the place and surrounding country some time before. He is now fast gaining a large practice. The next to enter into practice at LeMars was Dr. Mary Breen, who located here in the spring of 1890. Her practice but proves that woman has useful sphere among the highest of professions, and that proper training makes a lady master of science, as well as her brothers, who, not many years ago, were supposed to have a sort of God-given monopoly of the science of medicine. The first physician to practice at the village of Remsen was Dr. Arbuthnot. He was a graduate from the Keokuk ( Iowa ) Medical College . He came to Remsen in the early spring of 1883, practiced a few months, and then removed to Nebraska . Dr. Henry Jay Brink, a graduate from the University of the City of New York , commenced practice at Remsen, May 27, 1883 , having practiced a short time at Warren , Ill. He is a skillful doctor, and has already won a large and lucrative practice in the entire northern and eastern portion of Plymouth county. Dr. James T. Marsden, of Utica , N.Y. , located at Remsen about January 1, 1884 , where he continued to practice about eleven months, after which time he removed to Denver , Colo. He was a graduate from the medical department of the University of the City of New York , in the class of 1882. Dr. Seigel came to Remsen from Des Moines , Iowa , May 25, 1888 , and practiced four months. He was a graduate from the Eclectic College of Cincinnati, Ohio. Not liking the town he located at another point. Dr. Jenkens, a graduate of Omaha Medical College , came to Remsen about June 1, 1888 , and remained for five months. Dr. George Ropke and Dr. H.J. Brink are the only physicians now practicing in Remsen. The physicians who have practiced in and about Akron are as follows: R.D. Clark, M.D., from Rush Medical College , Chicago , Ill. (regular), practiced for a time in Wisconsin , and during the month of May, 1876, located at Akron . He is a man possessed of a broad mind, is skillful in his profession and an honored member of society throughout the Big Sioux valley, in which section, for the past fourteen years, he has been steadily building up a large and successful medical practice. G.V. Ellis, M.D., is a partner of Dr. Clark. He graduated from the Omaha Medical College , first practiced at Calliope and Hawarden , Iowa ; he located at Akron , April 22, 1888 . John Tremaine, M.D. (eclectic), came from Dakota in 1886, and practiced a short time. Dr. A.M. Cross (homoeopathic), a graduate of the medical department of the Iowa State University , at Iowa City , practiced at Missouri Valley , Iowa , awhile, then a short time at Akron . The writer has been unable to get further particulars regarding these physicians. The first to practice medicine at Kingsley was Dr. J.W. Walcutt, a graduate from Louisville ( Kentucky ) Medical College . He located at Quorn, and when the business was moved to Kingsley he became the pioneer at that point. He still practices. Dr. R.D. Mason, a most estimable gentleman and skillful practitioner of the regular school, is one of Kingsley's most trustworthy and successful physicians and surgeons. He came to the place in the autumn of 1888, from Delaware county, Iowa , where he had practiced. He is a graduate of the class of 1887 at the State University at Iowa City , Iowa . Dr. J.J. Wilder, a graduate of the Keokuk ( Iowa ) Medical College , located at Kingsley a little prior to 1888, and is still one of the successful practitioners of today in this locality. Dr. E.H. Banks, a graduate of one of the Ohio medical colleges, also practices here, and is proprietor of a drug store in Kingsley. At Merrill, a Dr. Jenkins, a new comer, is the only physician at present. At Hinton, Dr. Henry Nigg, who graduated at Iowa City in 1888, practiced for a time, but is now engaged in the drug business at Merrill. Contributed by the County Coordinator, Linda Ziemann. 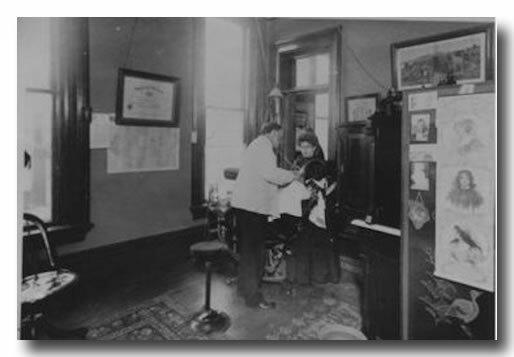 Dr. Ephraim David Brower at work with an unidentified patient in his office over Frank Miller's store. ~Thanks to David W. Brower (a distant cousin of Dr. E.D. Brower) for submitting this picture. This is a great view back to the modern doctor's office of an earlier time! Dr. C. M. Hillebrand, Physician and Surgeon. Office over King’s Hook Store, opposite post office. Residence Old Townsend place on Court st. Office hours from 1 to 2 and 7 to 8 p.m.
W. R. Gray, M.D. Homeopathic Physician and Surgeon. Co is promptly answered day or night from office in Opera House Block. Dr. Cole, office Opera House Block. Residence two doors north of the German M.E. church, Main st., LeMars. Prompt attention given to all calls. Dr. E. O. Baxter, Physician and Surgeon. Will attend all calls promptly. Office at sanitarium over Norris’ meat market. Residence on Plymouth st., third door west of Clark st.
ed. by William S. Freeman. 2 Vols. Physicians and Surgeons--Dr. J. M. Fettes, Dr. Roy Bellaire, Dr. T. E. Cole, Harvey & Harvey (chiropractors), Dr. D. A. Jay, Dr. M. (Martin) J. Joynt, Dr. J. A. Lamb, Dr. G. H. Mammen, Dr. A.H. Mosher, D.C.D. Ray (osteopath), Dr. W. T. Sheppard, Dr. M. W. Richey, Dr. R.P. Wild, Dr. J. L. Reeves, Dr. Mable Willet. Contributed by Cathy Joynt Labath. About two months ago at 8:30 one evening, I lost the better part of the finger tips (one entire finger nail) on my left hand in a lawn mowing accident. While writhing in pain, I could think of only one thing – “Where can I find Dr. O'Toole at this time of night?” My wife, dispatched to find him returned in a minute. “He's waiting for you at the clinic!” My worries ended. Anyone who does not know Dr. L. C. O'Toole might envy my luck. However, such is not the case. For more than 40 years, this good doctor has given LeMars exemplary “round-the-clock” medical service. When a pregnant LeMars woman recently decided to entrust a Sioux City obstetrician with the delivery of her child, he queried her judgment. “Why come to me? You have the best baby doctor in the state in LeMars,” he said, referring to Dr. O'Toole . Though the exact number is unknown, he estimates he has delivered around 4,000 babies—a total which includes three of his own children. Many mothers are thankful for his minimal use of anesthetic to experience a more satisfying “natural” delivery. While some of his profession still insisted the delivery room is “off limits” to male parents, Dr. O'Toole has long encouraged fathers to be present. In this way, he has enlightened many fathers who now view birth as an even greater miracle than they might otherwise have imagined. On the other hand, he has a certain charisma about him. One always feels relaxed in his presence and, at the same time, confident he is receiving the best medical treatment available—never does one feel “rushed in and out.” He has mastered the “bed-side” manner aspect of his profession. It is this gift which makes him a versatile spokesman on an infinite number of subjects. He seems to be a student of mankind. Obviously, he is more than a good obstetrician. He is an excellent family doctor. He proves general practice is a specialty in its own right. We, who are accident-prone, realize with each new “adventure” how fortunate we are to have him as our physician. But he is more than a physician. From the mid-30's to the mid-50's, he served on the LeMars school board. His last year in that role the board purchased the 42 acres on which Carey gym, the high school and junior high now stand. The, he served an additional 10 years on the Gehlen school board. While “weaker” men might welcome retirement, this perennial 39-year-old has more important things to do than sit in a rocking chair. And we who are his patients sleep peacefully each night knowing should a medical emergency arise he is never more than a phone call away.